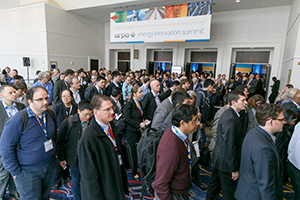 The Technology Showcase at the ARPA-E Energy Innovation Summit offers a look at America's future energy technologies. Technology Showcase participants include ARPA-E-funded project teams as well as a highly selective group of researchers and technologists from other companies and organizations. Unlike other conferences where anyone who pays the booth fee can participate, the participants in the ARPA-E Technology Showcase must pass a thorough vetting process to be included. Our vetting process ensures that attendees are meeting with the best in the industry. Active ARPA-E Awardee project teams are automatically approved to participate. Other organizations may apply to exhibit in the Technology Showcase. Technology Showcase applicants must have a transformational energy technology to demonstrate in their exhibit space. ARPA-E Awardees are guaranteed admission to the Technology Showcase. Registration details will be provided by ARPA-E and eventPower directly to project team leads in Fall 2018. For partnership opportunities download the Partner Prospectus by clicking HERE. If accepted to the Technology Showcase, the cost would be $395 for the booth and company to register in the appropriate category. The application period to apply to showcase at the 2019 ARPA-E Summit is now closed!